I love pickled eggs; cooked to perfection, and preserved in a spicy brine they make an easy to grab yummy snack. Pickled eggs are perfect straight from the jar, or can liven up your usual egg salad or devilled eggs with no extra effort. Have you ever seen the jars hanging out on the counter in a pub or corner store? I am afraid of those eggs. I don’t care how tasty they may be, I am not going to eat them. I may be overly cautious, but the fear of botulism tends to make me shy away. In my research, out of the billions of pickled eggs ever consumed there was only one man who died from botulism in pickled eggs. After making them, he left them on a sunny counter for a week. I don’t want to scare you away from making pickled eggs, but I want you to be informed. There is a possibility for botulism when pickling eggs. There is no tested safe method for canning pickled eggs at home for pantry storage. Following these basic guidelines makes pickling eggs quite safe. *Jalapeño can be omitted if you prefer, or use a whole jalapeño if you want extra spicy pickled eggs. **My pickling spice is a mixture of mustard seed, coriander, bay leaves, dill seed, fenugreek, cinnamon, ginger, allspice, red pepper, black pepper, and cloves. Thinly slice jalapeños and onions and add to a sterilized half gallon glass jar . Add a sprig of dill. Add peeled eggs to jar. Add all other ingredients to a small pot and bring to a boil. Reduce heat and simmer covered for 5 minutes. Pour hot brine over eggs and top with lid. Jostle the jar a bit to force air bubbles to the top. To prevent breakage, I placed the jar in a bowl and ran hot water into the bowl for several minutes to warm up the glass before adding the hot vinegar solution. Let cool on counter for 2 hours and place in fridge. Allow eggs to pickle for at least 3 – 4 days, 1 or 2 weeks is better if you can stand the wait! I managed to wait 4 days! Eggs will keep in fridge for 3 months. Eggs that have been in the fridge for a week or two tend to peel easier, fresh eggs are notoriously difficult to work with. Place your eggs in a large pot and add cold water to an inch above eggs. 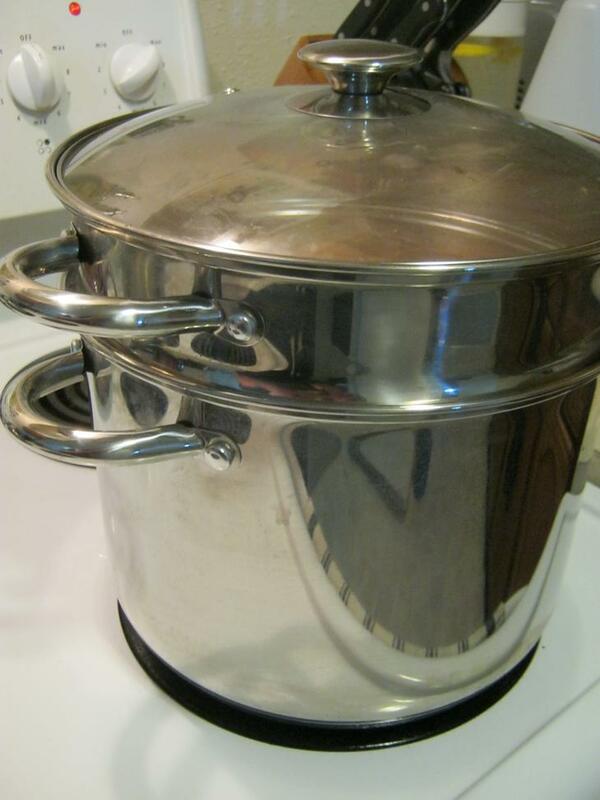 Cover with lid and bring to a full rolling boil. Remove from heat. Without removing lid, leave eggs to cook in the hot water for 18 – 23 minutes. For 24 large eggs, I waited the full 23 minutes. OR leave the eggs at a full boil for 10 – 12 minutes to hard boil. Pour off the hot water and immediately run cold water into the pot to stop the cooking process and cool the eggs. This also prevents the outside of the yolk from getting that grey/green coating around it. I used a pot with a pasta insert , making it super easy to remove the eggs from the hot water quickly. Run cold water into the pot until it stays cold. For eggs that are easier to peel, leave eggs to cool for half an hour. Tap the shell using the back of a spoon to break it all the way around and on the larger end of the egg. Start peeling at the large end of the egg (there is an air pocket there), and peel carefully to avoid breaking the whites. Rinse eggs under cold water to remove any small pieces of shell. Only eggs that are in perfect condition should be pickled. It is a good idea to make a few extra eggs just in case a few are ruined while peeling. 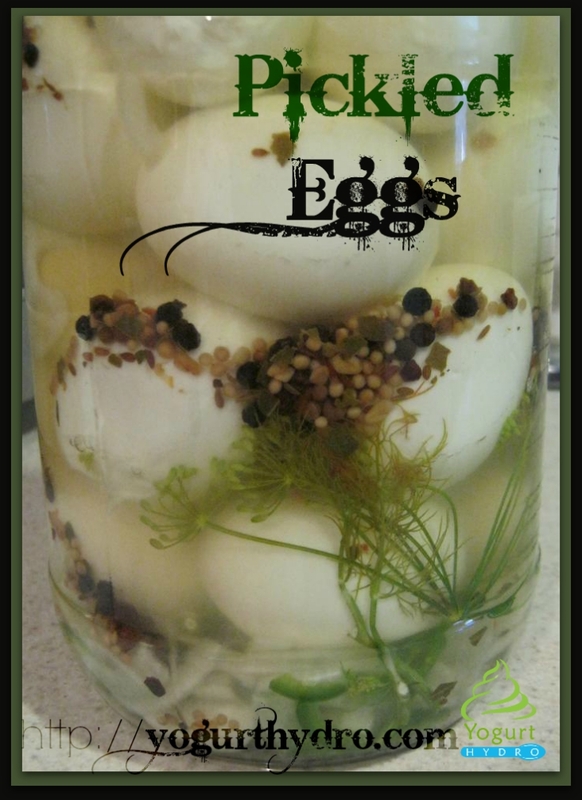 Do you have a favorite pickled eggs recipe? Do you have any tips or tricks for peeling hard boiled eggs? Please share in the comments! I have been looking for a good pickled eggs recipe to make for my husband. 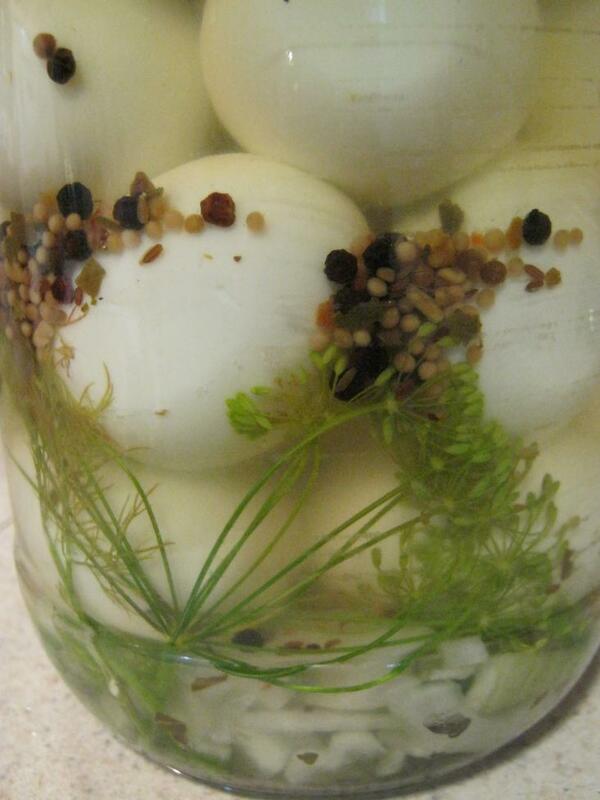 You have some great tips for making good pickled eggs too. Thanks so much! Thanks homesteadwishing, I hope you enjoy them. :) The waiting is the hardest part! My mom used to make pickled eggs…and my husband loved them. It has been a very long time since he had them…maybe I will have to make him a special treat. Pickled eggs were something my mom used to make a long time ago. I never really liked them….but my husband LOVES them!! YUM. This is a great guide! Great sounding recipe, I will have to try. They are easy to make. The hardest part (other than the waiting!) is peeling the eggs without destroying too many of them. I made a few extra and had an egg salad sandwich afterwards! My uncle made pickled eggs a few years ago and they were really, really good. I kept them in the fridge, of course. Your recipe is making me want to try them myself. I’m glad my post reminded you of home – your old stomping ground is right in the middle of the area I was writing about! East Hastings, especially, has changed a lot. It’s becoming a gastro hotbed. Hahaha, thanks for the visual, I have this clear picture in my mind of her blowing off the dust to hand you an antique pickled egg lol. Lucky you! We’re planning to get chickens again, hopefully this spring – I miss the fresh eggs, they are so delicious! Store bought have no flavor by comparison! First time I’ve heard of pickled eggs. I should try this for salad. Thanks for sharing. I haven’t had pickled eggs in years!